A paint device for rendering to a PDF. 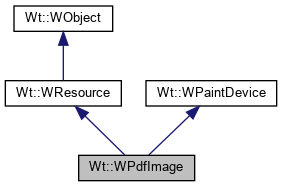 A WPdfImage paint device should be used in conjunction with a WPainter, and can be used to make a PDF version of a WPaintedWidget's contents. The PDF is generated using The Haru Free PDF Library, and this class is included in the library only if libharu was found during the build of the library. A constructor is provided which allows the generated PDF image to be embedded directly into a page of a larger libharu document, and this approach is used for example by the WPdfRenderer to render XHTML to multi-page PDF files. images (WPainter::drawImage()) can only be included from local files, and only JPG and PNG images are supported. Create a PDF resource that represents a single-page PDF document. The single page will have a size width x height. The PDF will be using the same DPI (72dpi) as is conventionally used for the desktop. The passed width and height (such as 4 cm by 3 cm) can be specified in physical units (e.g. 4cm x 3cm), but this will be converted to pixels using the default DPI used in CSS (96dpi) ! Create a PDF paint device to paint inside an existing page. The image will be drawn in the existing page, as an image with lower-left point (x, y) and size (width x height). If Wt has been configured to use libpango, then font matching and character selection is done by libpango, which is seeded with information on installed fonts by fontconfig. In that case, invocations for this method is ignored. Only TrueType fonts are supported. You may need to add more glob patterns to exclude other fonts than TrueType, and also to exclude TrueType fonts which do not work properly with libharu. If Wt has not been configured to use libpango, then this method may be used to indicate the location of TrueType fonts. The main drawback compared to libpango is that font selection is not steered by the need for particular characters, i.e. font selection is independent from the text's need for specific characters. Most TrueType fonts provide only partial unicode support. The provided directory will be searched for fonts (currently only TrueType ".ttf" or ".ttc" fonts). TrueType fonts are preferable over Base-14 fonts (which are PDF's default fonts) since they provide partial (or complete) unicode support. When using Base-14 fonts, WString::narrow() will be called on text which may result in loss of information.